Depending on what elements are required for a particular product, most presses can be designed with specific compounds in mind. Compression Press – Grimco Presses Inc. 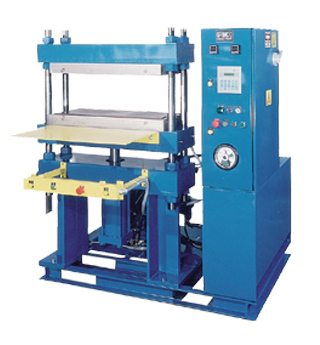 There are many different types of hydraulic presses, one of which is the compression press. Similar to the processes found in rubber molding and injection molded plastics industries, compression molding presses are designed to produce mass amounts of consistently shaped products. Though compression presses may be ideal for manufacturing tight-fitting products such as extruded rubber seals and stoppers, they are also found to be quite helpful within the automotive industry, since they can produce many car parts such as fenders and car hoods. Other products that come out of these presses include plastic cases, electrical equipment and all kinds of toys for children. No matter what the application, however, compression presses are capable of handling large product runs for a variety of industries and can also complete jobs within a short amount of time. Whether its seals, hoods, toys or anything else, most products that come out of this process have a relatively smooth surface, which is another added benefit to this type of molding. Typical materials used in compression presses include plastic compounds, rubber and metal alloys. Some specific examples include Polyester, Vinyl, Torlon, Vespel, Poly P-phenylene sulfide and various forms of PEEK. Though compression presses have the ability to mold different metal alloys, a better option for most iron, steel and aluminum molding would involve the use of forging presses. In any case, since all compounds mold differently, it is important to keep in mind the amount of material used when working with a compression press. It is also equally important to pay attention to temperature and force so as to ensure that the end product maintains the desired texture and form. In contrast to their ability to produce a wide variety of products from an assortment of different materials, compression presses bring reduction to parts replacement, downtime and noise. This is possible because molds are reusable, machines can continue to run without interruption and whereas former molding processes generated fair volumes of noise, the process used with these presses is much quieter. Compression Press High pressure from compression presses produce perfectly molded products. A compression press is commonly referred to as a compression molding machine and is primarily used for manufacturing plastic and rubber molded goods and also products made from metal alloys.